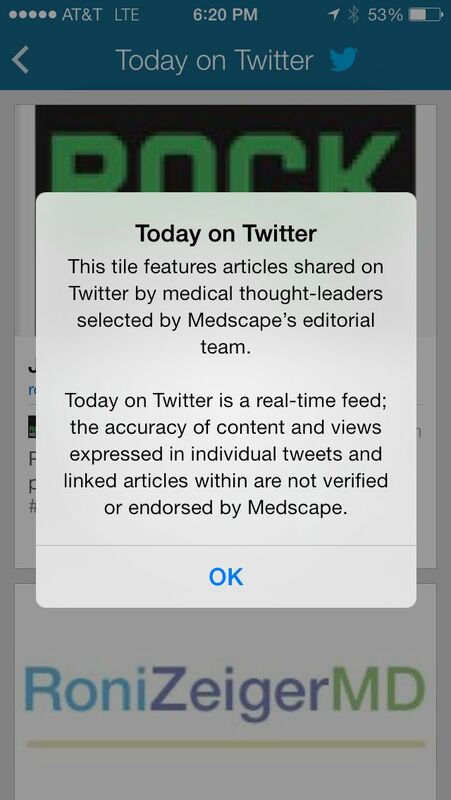 Medscape’s primary medical reference smartphone app has earned a highly coveted spot on my iPhone’s home screen. 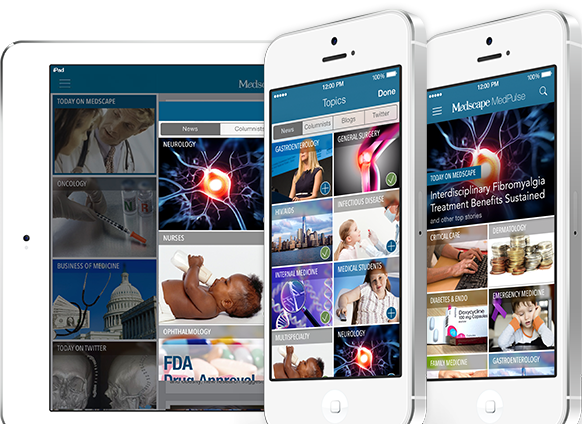 The development team at Medscape recently followed this up with MedPulse, advertised as the only medical news app you’ll ever need. MedPulse promises a highly configurable experience for receiving the latest news updates that are relevant to your specialty. 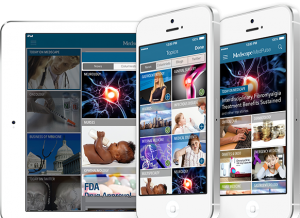 MedPulse impresses with a focused attention to fine detail and serves as a strong first release, although the long-term utility of the app will rely heavily on the quality of its content curation. It presents the data in a manner that is visually appealing and easy to browse. Much like Facebook’s Paper or Flipboard, MedPulse’s user interface relies on panels focused on certain topics, which can be customized by the user. For example, the default categories selected were Today on Medscape, Internal Medicine, Business of Medicine, and Today on Twitter. Tapping on a panel brings up a list of articles related to that topic, each with a large photo, title, and brief description of the article. By selecting an article, the full-length article is seamlessly displayed within the app, without the bulky feel of a web browser shell. By tapping on the panel with a plus icon, the user can add various topics and specialties, which are sorted by “news/columnists/blogs/twitter.” The News category includes the medical specialties and some generic topics such as Business of Medicine and Videos. 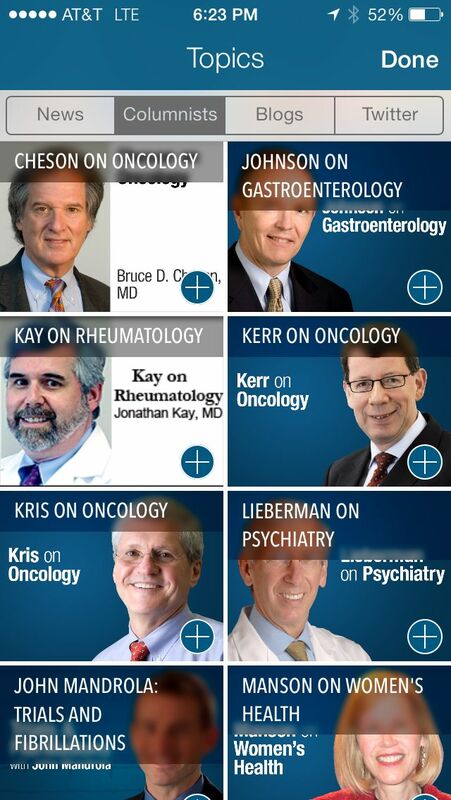 The columnists tab includes the option to add Medscape expert blogs to your Home screen. 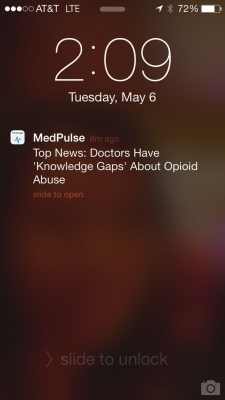 Lastly, the MedPulse app pushes out medical news updates on an approximately daily basis with the top news of the day, even when the app is not running. While Medscape’s primary app also pushes out occasional news briefs, MedPulse seems to have a lower threshold of what is newsworthy. One such announcement, Doctors have ‘knowledge gaps’ about opioid abuse, which could be bothersome for some users. When I launched MedPulse for the very first time, the app brilliantly recognized my login credentials for my already installed Medscape app. This was a pleasant surprise because remembering my rarely used password for Medscape and Epocrates usually frustrates me to no end. Furthermore, the app very cleanly adopts iOS user interface principles, with a flat and clean design. Like many other apps, MedPulse features a menu icon on the top left, which brings up a navigation menu. The menu animation is quite simple, but fast and playful giving a polished feel that is sadly often ignored in medical apps. 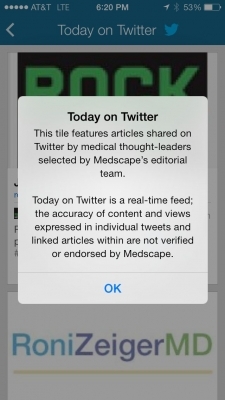 Much like Flipboard and Facebook’s Paper, the MedPulse app maintains a sleek and graceful experience throughout. Images fade into view, navigation is intuitive, and the structure of the app doesn’t get in the way. Lastly, I applaud the inclusion of Today on Twitter as one of the default panels, as it raises awareness to the utility of Twitter when it comes to browsing the latest in both digital and traditional medicine. The list of articles within the Twitter-focused panel demonstrated some curation by only including more established sources, such as @Erictopol or @iMedicalApps. While the app’s design and user experience receive high marks all around, the content still requires additional maturation and evolution. 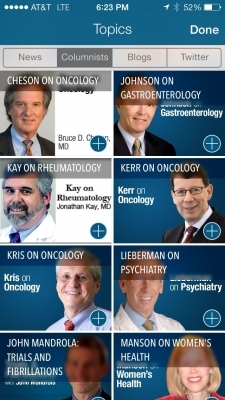 Medscape’s internal content, primarily featured in the Today on Medscape panel, strikes a delicate balance between clinical relevance and frequency of articles. If you’re subscribed to their email lists, the quality of their articles parallel their email updates, and I found the articles compelling and clinically meaningful. Unfortunately, many other panels of topics have not achieved that same balance, especially once you go beyond the primary and specialty topics. For example, many of the Medscape Columnist panels only feature new articles written once every several months, so it’s difficult to justify adding such a panel to your list of subscriptions. Another area for improvement would be in the customizability of the app. While different topics can be added to the Home screen, the default topics are permanent. This leaves Medscape in control of the primary content you receive, and the Today on Medscape receives the most prominent place on the main screen. Lastly, the news notifications that are pushed to your smartphone could benefit from more fine tuning. During my time using MedPulse, a news notification would come in approximately once a day, and would often be not related to my primary specialty (endocrinology). It would be nice to be able to change the threshold to control the frequency and quality of the news alerts. Do I really need a medical news app? With MedPulse, I’m left in a similar place as I am when it comes to other news aggregators such as Facebook Paper and Flipboard. These content curation apps are visually appealing, easy to navigate, and well-executed. 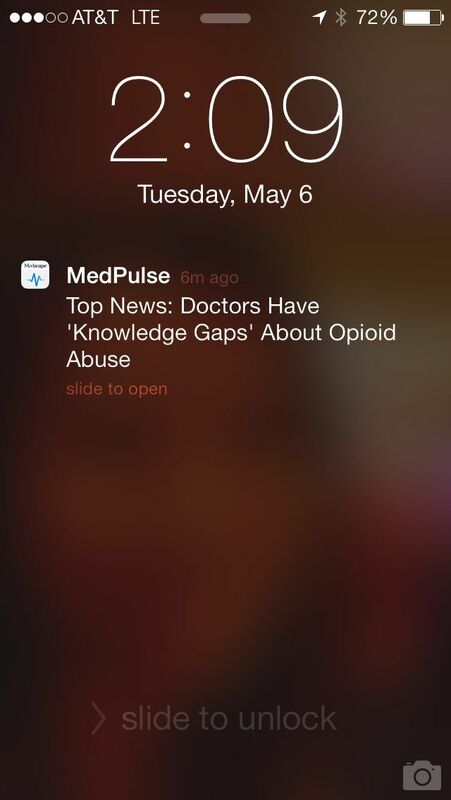 Really, the MedPulse app is top notch. However, in the short time using MedPulse, I rarely launch the app on my own accord. When seeking out medical news, I revert to more familiar, traditional outlets, such as medical journals or mailing lists. To Medscape’s credit, some news announcements are highly relevant and are clinically beneficial, especially for practitioners more removed from didactics and academic grand rounds. For now, I’ll definitely leave MedPulse installed and benefit from the news updates it pushes to my phone from time to time. 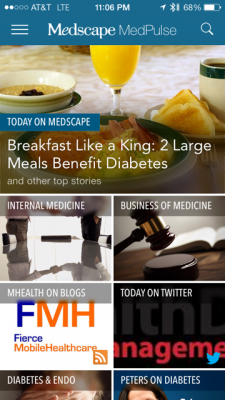 The team at Medscape has achieved their goal of making MedPulse the only medical news app I’ll ever need, but I find myself wondering if I ever needed one in the first place.